Welcome to Day 26 of the 31 Days of iOS. Yesterday, we wrapped up a two part mini-series on life cycle events on the application object and view controllers. Today we’re going to start discussing the very important topic of Push Notifications. Push notifications enable your apps to get information from an outside source. Instead of your app only being able to pull information down when running, we’re going to see how it’s possible to send data to our apps whenever we want. 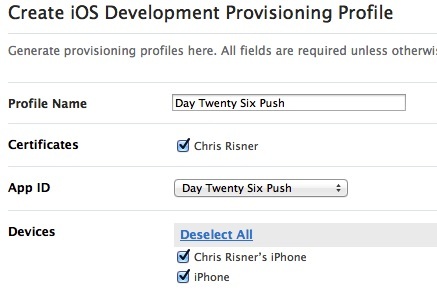 One VERY IMPORTANT thing I’d like to point out is that you NEED to be a registered iOS developer in order to follow along today. There are steps you can’t take (like moving the app to a device) unless you are. Also, you can’t test push notifications on the simulator, you’ll need to have an iOS device in order to test this out. We won’t be doing any coding today as there is a lengthy set up process we need to go through first involving the Apple developer portal. Tomorrow we’ll implement all of the code and actually test out our push notifications. In order to test and demonstrate push notifications, we have to have some way to send those push notifications. Unfortunately, there isn’t a way to do that from the Apple dev portal. What we really need is a computer that can send information to Apple’s Push Notification Service (APNS) in order to have it deliver the push notification. I could always run something locally or deploy something somewhere but in order to make things as easy on me as possible and not focus on the server side today, I’m going to use something I am familiar with, Windows Azure Mobile Services. This will allow me to easily test out sending a push notification without us getting into specifics of how it’s done. Once you’re done reading this, if you’re interested I have a bunch of other articles on what you can accomplish with Mobile Services besides just testing push which we’ll do today. As you can see, Push Notification are marked as Configurable. Depending on where your app is in your list, you may not be able to see the column headers but all of the indicators on the left side are for the Development version of your app and the right are for Production. Click on the Configure link now. This will allow you to export a Personal Information Exchange or p12 file. However you are testing your push notifications, you’ll need this file to sign your requests to send a push notification. The APNS servers then inspect those requests to make sure they were signed with the same p12 file. When you do the export, you’ll have the option to enter a password. It’s recommended that you do, just don’t forget what that password is. Now return to the portal and you should see the light has changed from yellow to green and says Enabled for the development push settings. If that all went well then you’re ready to test out push notifications. We’ll be addressing the coding portion of that tomorrow. Today we started reviewing how push notifications work with APNS. We covered the first half of what is necessary with push notifications which was all done in the Apple developer portal. 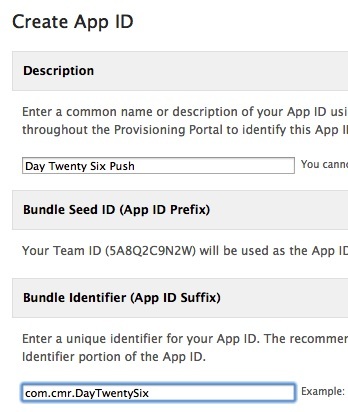 Due to how each device is tied to a developer account and every app that goes on those devices needs to be signed and every request to APNS has to be signed in a way that matches up with what’s in the portal, the set up process was pretty complicated. Thankfully this means that all we need to do tomorrow is the code.